D’Arcy McGee’s Irish Pub is an overlooked gem downtown. In the bar and restaurant industry, competition is not always a bad thing. This question may become most beneficial for nearby D’Arcy McGee’s, an off-Chippewa weekend and summer favorite, but one whose authentic Irish pub interiors and stout-laden comforts have gone underutilized by downtown’s casual drinking crowd for far too long. Named after Thomas D’Arcy McGee – an Irish-Canadian politician and one-time Buffalo-based journalist who was assassinated in Ottawa in 1868 – the pub has operated as a crowd-pleasing bar against an imported backdrop since 2001. It offers all the traditional food necessary to make it a popular spot before and after the city’s St. Patrick’s Day parade, and it’s not a Guinness- and Pogues-only affair the rest of the year, either. It also can turn out double-shots of Three Olives Orange and Justin Timberlake to college grads and young professionals. Similar pubs are a dime a dozen in Northeast cities such as Boston or Philadelphia. What makes D’Arcy’s distinct is that, despite Buffalo’s detailed Irish history, the pub is the only one of its kind downtown. Is this absence of quasi-Gaelic-loyal locales surrounding the city’s commercial district sad? Yes. 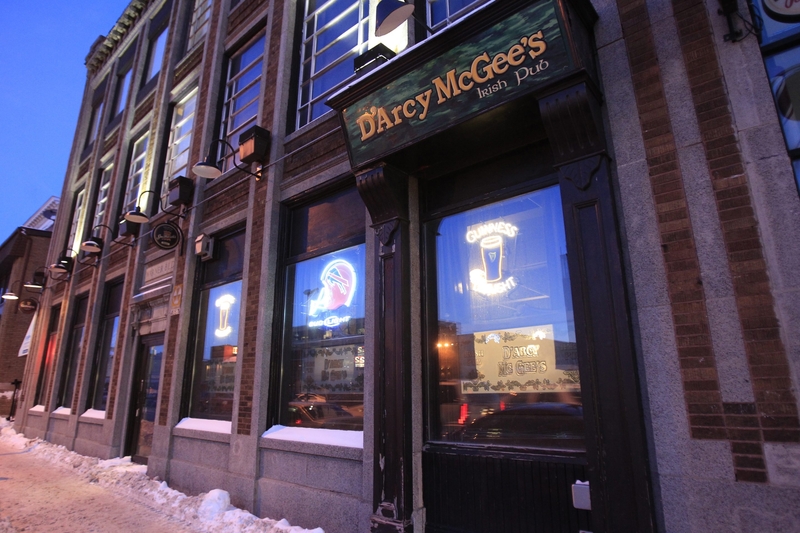 Thankfully, D’Arcy McGee’s can provide adequate refuge for those seeking such accommodations – dependent on the night. On a recent Wednesday night, I found D’Arcy’s front barroom after walking past bundled patrons filing into Dinosaur’s grand opening just down the street. Its expansive interiors feature all the shipped-from-Ireland fare you’d expect to see in an American Irish pub: polished oak on the bartop, tables and walls; Paddy and Powers whiskey mirrors behind the bar; and old Irish antiques arranged on shelves. On such a numbing winter night, the pub separated itself from other local bars with a few favorable traits. Among its eclectic choices of $4.50 draft beers is Killian’s Irish Red, now apparently on the comeback with such ’90s throwbacks as cassette tapes and the Cranberries. The pub’s vast selection of Irish whiskeys and single-malt scotches (ranging from $4 to $16) are accommodating for those looking to restore color to their face. And guests can grab a pint and pull up stools to either of a pair of roaring fireplaces for the ultimate exhale. I ordered a pint of Guinness and found the pub’s backroom fireplace, nestled inside a raised landing decorated like a home library. Sitting on a miniature felt-topped stool and surrounded by secondhand copies of “The Lockwood Concern” by John O’Hara and “The Caine Mutiny” by Herman Wouk, I thawed beside the fire, sipped the head off my stout and briefly wondered whether downtown workers and wanderers were aware of the peaceful weeknight solitude available inside this overlooked outpost off the Chippewa fringe. It’s wild around March 17 and on summer weekends, but how about a winter Wednesday night? Doesn’t the idea of a fireside chat with friends amid the embrace of ethnic interiors appeal to you? If so, it’s time to take advantage of the weeknight comforts of D’Arcy McGee’s. With increased traffic accompanying Franklin Street’s rise as Buffalo’s “Restaurant Row,” the subtle allure of the strip’s Irish pub won’t remain a secret for much longer. Where: 257 Franklin St. (853-3600, www.darcymcgeesonline.com, Facebook and Twitter @darcymcgeespub). When to go: Weekend nights, Sabres pre- and postgame, or any time the day of the St. Patrick’s Day parade if you’re up for vibrant times off the edge of the Chip Strip. Try any weekday or weeknight if you’re up for lunch, dinner or a casual drink with friends or co-workers. Dress: Come as you are. Want to wear your Buffalo Fenians or Celtic Football Club gear? Even better. On tap: Featured selections include Bass, Blue Moon, EBC Blueberry, Flying Bison’s Aviator Red, Great Lakes Conway’s Irish Ale, Guinness, Harp, Killian’s Irish Red, Labatt, Newcastle and Sam Adams Alpine Spring. Price range: Appetizers, $4 to $9; sandwiches, entrees and specials, $7 to $16. Drink prices are $3 to $5 for beers (bottle or draft) and $4 to $16 for mixed drinks, shots or doubles on the rocks. How to pay: Cash, credit or debit. Parking: Lot next to building; plenty of parking on-street and in lots or ramps on Franklin.